There are two reasons you might find to sleep in your car. One: ROAD TRIP! Two: You’ve had a bigger night than you expected and now you can’t drive home. Cabs are expensive. You’re not a fan of Uber. It’s too late to catch any form of public transport. You could walk, you think, but a four hour walk in the dark isn’t a great plan. So you decide that you need to have a little kip in your automobile and you lay down across the back seat and start to snooze. But is it actually legal to punch some Z’s in your vehicle? Let’s find out. The legalities behind sleeping in your car are dependent on where you decide to rest your head for the night. Because there exists no Federal law in Australia that says sleeping in your car is illegal, it’s up to the state and local governments to dictate whether or not you can get in a cheeky nap in your four-wheeler. Thus, the actual legalities are a little muddier and different laws and by-laws will apply depending on the part of the country that you’re trying to enact your mobile siesta in. Things get even muddier when you throw alcohol into the mix. But let’s tackle sleeping in the car for camping purposes first. Generally, sleeping in your car is not illegal in Australia, but there are many exceptions to the rule especially in tourist hotspots. 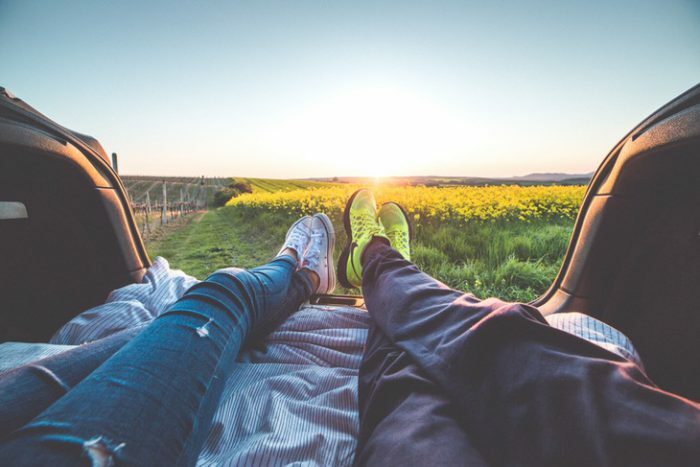 If you’re travelling around Australia in a camper van or just in your humble little Toyota Yaris, you may want to save a few extra dollars by sleeping in your car along the way. Again, there is no federal legislation around this – it is not illegal to sleep in your car, but various council by-laws exist in certain areas of Australia that will fine you for ‘street camping’ or sleeping in your car. For instance, in Byron Bay, the council has routinely issued large fines to street campers that occupy specifically signposted areas that designate camping is prohibited. Queensland has a specific law that states you cannot sleep in your car unless you are in a designated camping ground. If you’ve pulled stumps for the night in a State or National park that’s patrolled by rangers, you may be asked to move along from certain areas in the middle of the night. It’s worth checking the park’s rules and regulations around this. Generally, you’ll escape an immediate fine and rangers will caution you that you could be pinged for camping in certain areas, but it’s better to be safe than sorry. How about sleeping in your car after a big night out? Let’s make it clear – it’s illegal to be in charge of a motor vehicle whilst you’re intoxicated and there’s no two ways about that. If you are over the legal limit in Australia (a blood alcohol level of 0.05) and you drive a motor vehicle, you’re looking at a hefty fine and a whole lot of demerit points. But what if you aren’t driving it? If you’re drunk and you’re in the driver’s seat of a vehicle or in possession of the keys to the vehicle, there is a chance that legal action can still be taken against you. So if you’re feeling way too drunk to drive and collapse into your driver’s seat, even if you have zero intention of starting the car, you could still be in strife – there’s some significant legal precedent for this. If you’ve parked the car and jumped into the backseat, haven’t put the keys into the ignition, then you may think you’re safe but even then you may be liable purely because you have the keys in your possession. Although road laws are governed by states and territories in Australia, our drink driving laws are very similar across the country, so no matter where you are, being in possession of a motor vehicle while intoxicated could land you in hot water. Worth keeping in mind next time you decide to hit the hay in your hooptie.